Rep. Dan Newhouse, R-Wash., has called on Congress to protect federal hydroelectric dams as a "top priority." (Tri City Herald, "Newhouse Pushes for Law Protecting Snake River Dams," Nov. 10). This plea asks Americans to stay on a course that hastens the disappearance of salmon from our rivers, continues to burn through taxpayers' hard-earned money at a substantial loss, and adds insult to the injury by reneging on promises made to First Nations people more than 150 years ago. Newhouse states that salmon survival past these dams is already 99 percent, but that's wrong. The Army Corps of Engineers claims the real per-dam number is 93 percent to 97 percent, but Snake River salmon must pass eight dams. Average survival of 95 percent through eight dams results in a combined survival of just 66 percent, which still ignores all the juvenile salmon that die in warm, slack-water reservoirs or die later from injuries sustained during dam passage. The overall survival rate of juvenile Snake River salmon? For most populations, it's 50 percent or less. The letter fails to mention the annual cost to taxpayers of keeping these dams. For example, the Corps recently spent $27 million on sediment management for just one reservoir and plans to spend more. 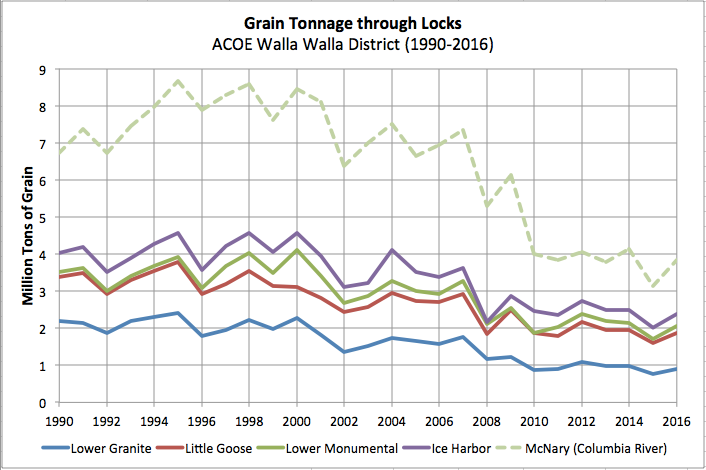 And that doesn't count expensive lock repairs like those to be incurred during a 15-week river closure beginning in December, or annual operation and maintenance costs of tens of millions. Taxpayers finance these costs, a giant subsidy almost exclusively to a single segment of one industry. The return on this investment? Less than 50 cents for each dollar spent. In fact, because dam infrastructure is so deadly to wild salmon populations, federal agencies have shelled out billions in an attempt to rescue these fish from harm. But as a federal judge pointed out for the fifth time in May, these mitigation measures have not been effective. Our salmon still hover on the brink of extinction. The claim that returns are improving and populations growing is an illusion. Sure, a hundred returning salmon is better than 50, and 1,000 is better than 500, but no credible scientist has suggested these "improved" returns indicate any real recovery. Meanwhile, barging has been in decline, with freight volumes now less than half what they once were. The capacity exists for producers to switch to alternative transportation, such as rail, which can be even more cost effective and climate friendly than barging. The Port of Wilma recently upgraded its rail access; major fertilizer bulk plants there will now ship 90 percent of their product by rail. Removing the dams would require a transition to alternative transport for some -- and farmers' needs would absolutely have to be factored in every step along the way. As it stands, continued operation of the dams needlessly pits farmers against fishermen. Finally, consider the definition of "boondoggle": a public project of questionable merit or "work or activity that is wasteful or pointless but gives the appearance of having value." That describes the lower Snake River dams today. The projects are wasteful not only of taxpayer dollars but also of wild salmon, a key cultural resource for indigenous communities and an irreplaceable icon of our region. It's time to remove the dams and revive the health of our waterways. Julian Matthews, is a Nez Perce Tribe member, and a co-founder in the nonprofit organization, Nimiipuu Protecting the Environment (NPtE).